As long as I can remember, I have loved eating pimiento and cheese. It would be rare not to find a bowl of it in my fridge. It’s good to have as a snack on a cracker or to use in a sandwich for lunch or supper on my favorite bread, and it is especially good with fried chicken. All remind me of our old summer days on the river, water skiing, and the wonderful picnic baskets of food that my mother made because we never had a picnic basket that didn’t have pimiento and cheese and fried chicken. Last week I happened to have one ripe red bell pepper, and in my fridge a package of Mexican Four Cheese that included finely grated Monterey Jack, cheddar, asadero, and queso quesadilla cheese. With those ingredients, I decided to try another type of pepper and cheese. Now the dilemma here is that I am not sure what to call it since it is not really “pimiento and cheese” because red bell pepper and pimiento pepper is different. The other difference is that my mother made pimiento and cheese with “hoop” cheese. It is a bright orange cheese with a red rind. Daddy kept a wedge of it up in the cabinet wrapped in white paper, and when he came in for a pick-me up he would get out the “hoop” cheese and crackers with his “toddy.” He never refrigerated it. That is why you will see instructions in some older cookbook recipes for pimiento and cheese that you are to “mash the cheese against the side of the bowl.” So, if you want the original, use hoop cheese (refrigerated to be safe) and pimiento, and just follow the recipe below for the “real” thing. 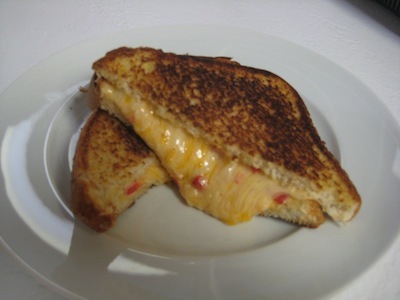 For the roasted red bell pepper, I diced it fine and put it together with some finely diced sweet onion, and a little cayenne, salt, the cheese, and my favorite mayo, and then made a sandwich and grilled it. I know that you may think that a grilled “pepper-cheese” is a winter sandwich that you would have with a good bowl of hot tomato soup, but this is a good opportunity to have the grilled sandwich with a good bowl of chilled tomato soup with basil in the heat of the summer. For me, since I always have pimiento and now, “pepper” and cheese around, then it’s just another avenue of preparation to enjoy one of my favorites. If you have fresh tomatoes in the garden right now, put a couple of slices on your pepper-cheese sandwich before grilling. If you have pimiento peppers growing, just follow the same recipe as for the pepper-cheese, roasting the pimiento peppers the same- wish I was at your house! Roasting the pepper: Take a sharp knife and cut a little sliver through the pepper to keep it from exploding when placed on the heat. If you have a gas stove, use tongs to hold the pepper by the stem and place it over a burner, and keep turning the pepper until it is charred and bubbly. If you have electric, place the pepper on a sheet pan and put it under the broiler, watching carefully, and turning until the skin is charred and bubbly. Then place the pepper in a bowl, and cover with plastic wrap or a kitchen towel to steam. When the pepper is cool enough to handle remove the skin. Use a sharp knife to cut the pepper open and remove the seeds and membrane. *Use caution when roasting pepper because the stem will ignite and burn, so watch carefully. Makes 2 cups when mixed. Note: I measured the cheese by cup and it measured 3 cups. But, by weight, it measures 8 ounces and the package says “2 cups.” So if you grate your own cheese, then use a solid measuring cup, and use 3 cups finely grated cheese. I can’t explain the difference but I measured it twice. After all ingredients are mixed with mayonnaise, it will measure out to 2 cups. Click on “How to Grow Peppers” for information on growing peppers at this GardenSmart Articles page.